The behaviour of the Falkirk fans who threw rubber eyeballs on to the pitch during Tuesday’s derby against Dunfermline has been included in the official report passed to the SPFL, writes Iain Collin. It is understood the league body’s match delegate Gregor McKenzie has mentioned the incident that targeted Pars player Dean Shiels, who had an eye removed in an operation in 2006. SPFL rulesdefine “disorderly conduct” as “using threatening, abusive or insulting words or conduct” and “conduct that stirs up hatred or ill will” based on gender, colour, race, nationality, religion, sexual orientation or disability, the last of which “means physical or mental impairment of any kind”. Any failure by a club to prevent “players, officials or supporters” from engaging in unacceptable conduct constitutes a breach. It is up to the club to prove “it was not reasonably practicable to do more”. Falkirk issued a statement condemning and apologising unreservedly for the “abhorrent behaviour of a small number of individuals”. It is understood Falkirk chairman Margaret Lang contacted the Dunfermline hierarchy on Tuesday night and promised to issue banning orders if the perpetrators could be identified. 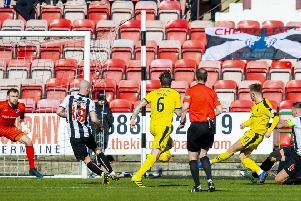 Dunfermline’s safety team and staff will pore over CCTV recordings today and will liaise with police, stewards and the SPFL.